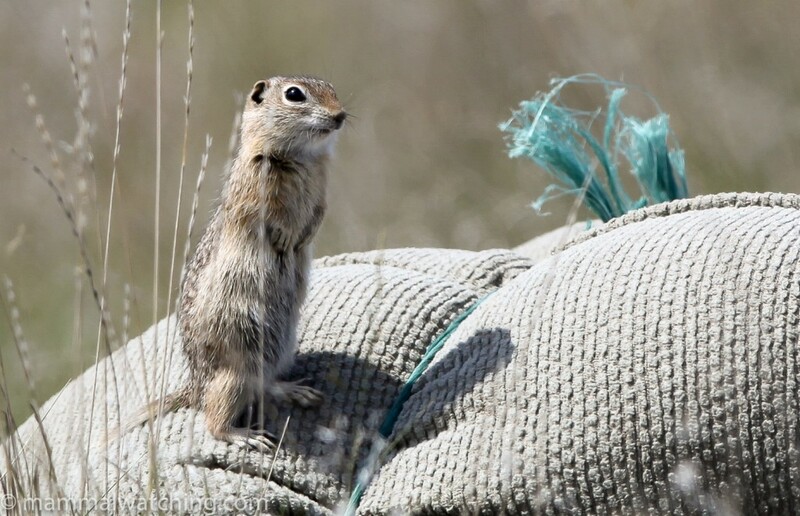 Last weekend I thought I’d make a quick weekend dash from New York to Washington State to spend 48 hours trying to find four Ground Squirrels I’ve yet to see. It is over 6 hours flying from New York to Seattle and the plane was delayed for another 2 on the tarmac in New York so I didn’t land until almost midnight Seattle time on Friday. I’d booked a car with shifty-Thrifty who, despite emailing me several times to remind me to pick up my car, had forgotten to reserve enough themselves. They’d run out of vehicles. I thought this only happened in France… Luckily Budget saved the day and gave me a Mustang in the process. My first stop was the Snoqualmie Winery at Prosser, about three hours from Seattle. I stopped en route and grabbed a few hours sleep and arrived at 8 a.m. 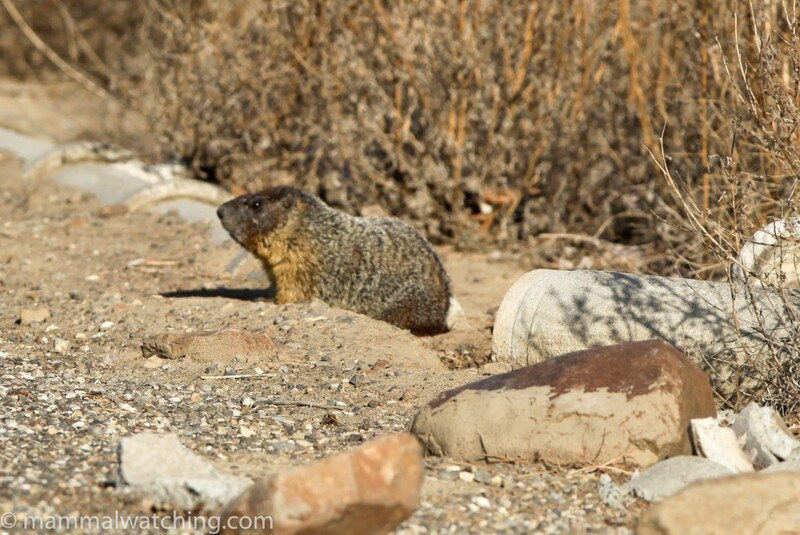 Though a Yellow-bellied Marmot had taken up residence in the culvert John Fox mentioned in his post, I found a Townsend’s Ground Squirrel at the beginning of the short drive into the winery, on the corner of the driveway and Frontier road – on the right as you turn into the winery. I also saw a ground squirrel in the central reservation of I 82, at mile marker 75, and at least two more during the first few miles of Hwy 22 (the road south of Prosser to Paterson). So this area is a bit of a hotspot for them. 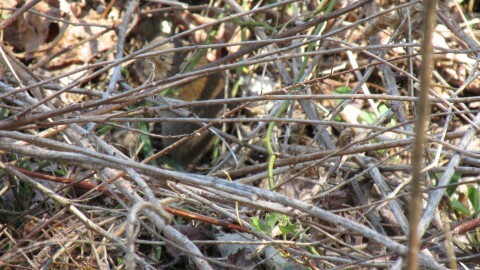 And I saw – while driving at high speed – what was presumably a Mountain Cottontail. Next stop was Nampa Idaho, a five hour drive, where I’d a rendezvous to meet Matt Miller who had a hot tip on some Merriam’s Ground Squirrels. Matt had originally suggested I head into Leslie Gulch, Oregon, an apparently beautiful area with a good population of the squirrels. But it is hard to access after rain, and there had been plenty. So we headed to Wilson Creek, which is Bureau of Land Management land about 25 miles from Nampa Idaho (the area is also known as the Hardtrigger Wild Horse Area). It is accessed from Wilson Creek Road and is a part of the 5 million acre southwestern corner of Idaho known as the Owyhees: I’d already visited a different part of this high desert, sagebrush and canyon land with Matt. 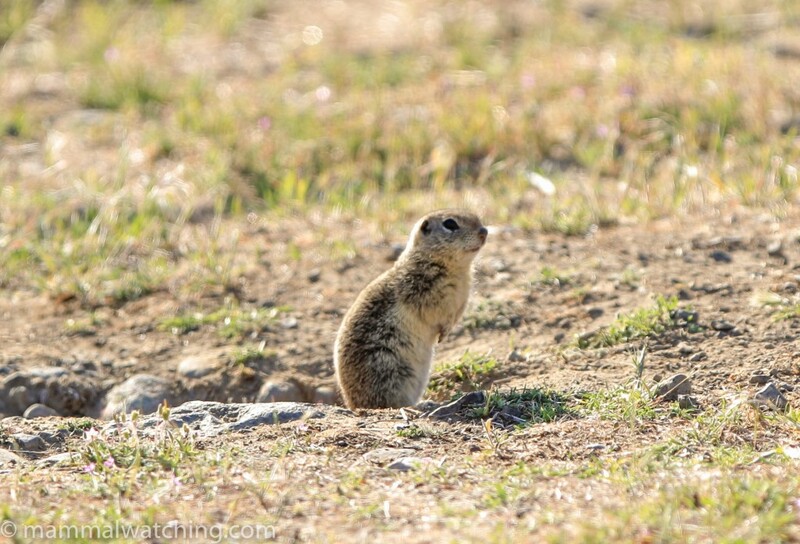 As always Matt came up trumps and we spotted a couple of Merriam’s Ground Squirrels. It wasn’t easy though. There was evidence – colonial burrows – of a decent population there, but perhaps the strong breeze was keeping them underground that afternoon. 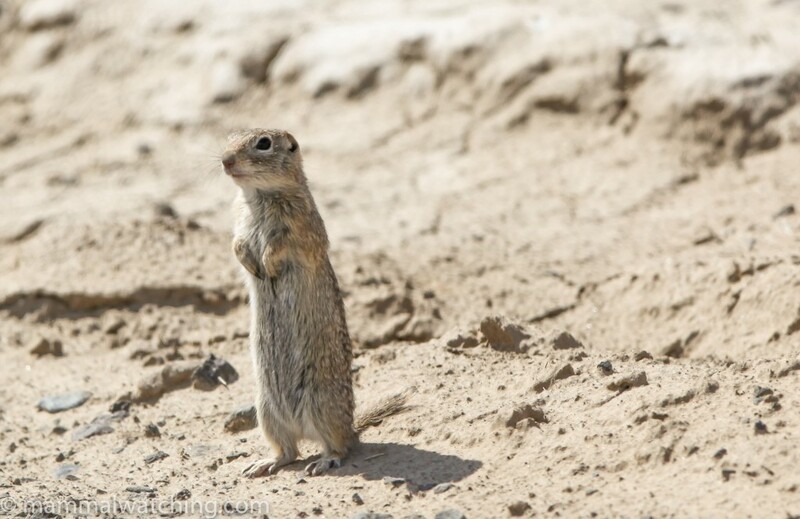 We saw a few White-tailed Antelope Squirrels and – after half an hour of walking and driving – Matt spotted a lone Merriam’s Ground Squirrel poking out of its burrow. I couldn’t get a photo. Matt dropped me back at my Mustang in Nampa and I drove back towards Washington State, spending the night in Pendleton, Oregon where I drank, ate and slept. I got to Moses Lake in central Washington at 10 a.m. the next morning and cruised a few of the dirt roads running north off Hwy 252 that lead to the Potholes Dam (John Fox details the spot in his report … it is only a few miles along Hwy 252 from Hwy 17, just south of Moses Lake). I was looking for Washington Ground Squirrels and I saw a few on the same dirt road John described, as well as two more along Hwy 252 including one just before the eastern edge of the dam wall. I was taking a photo of one squirrel – about 200 yards along the dirt road where John saw his – and I started squeaking to attract its attention. 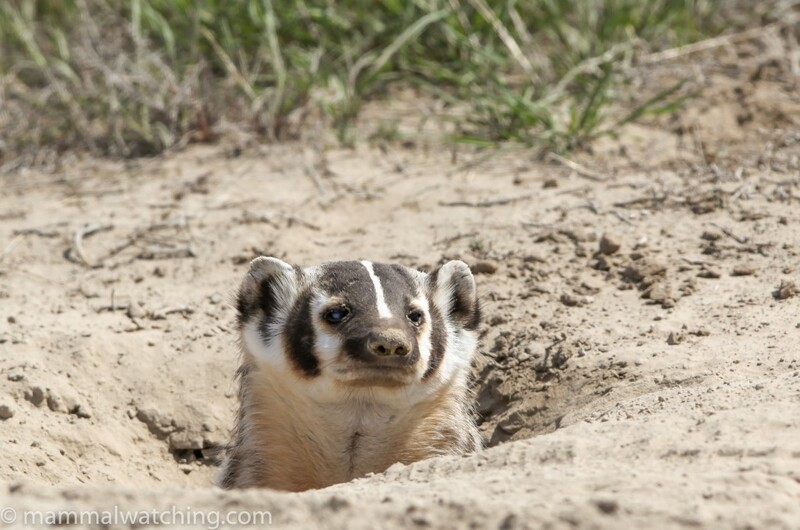 I woke an American Badger in the process: fun to see this species emerging from its burrow at midday. From Moses Lake it was another five hours or so to the all-weather Nisqually entrance of Mount Rainier National Park. This was my 3rd time on Rainier looking for Cascade Golden Mantled Ground Squirrels. 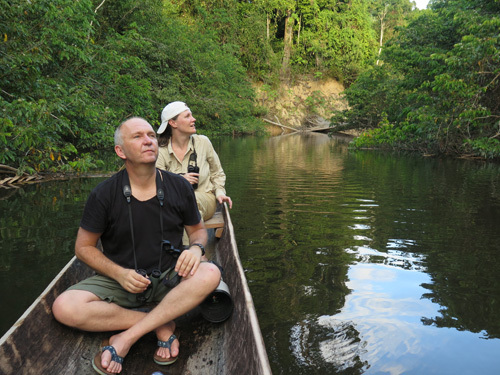 Each time I have been the rangers have given me conflicting – but apparently knowledgeable – advice on where to see them. 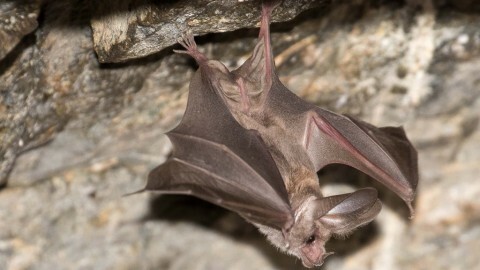 John Fox said they were abundant at the Sunrise Visitor Centre in mid-summer. I’d previously been in the park in late August (when I was rushed) and in October (when it was snowing) and failed to find them both times around the Paradise Visitor Centre. In early May the road to Sunrise is still well and truly snow bound, and there was far too much snow around Paradise (which in May is the end of the road) to even bother looking. A ranger told me that she had occassionally seen ground squirrels lower down in the park, including at the Kautz Creek picnic area, just a mile or two after the Nisqually entrance. But she hadn’t seen any this year and although I looked there I couldn’t see any squirrels at all. Presumably animals are still hibernating even if the snow had gone from the lower stretches of the park. I guess the Cascade Golden Mantled Ground Squirrel has a very short seasonal window of activity – possibly just late May through late August – on Mount Rainier. 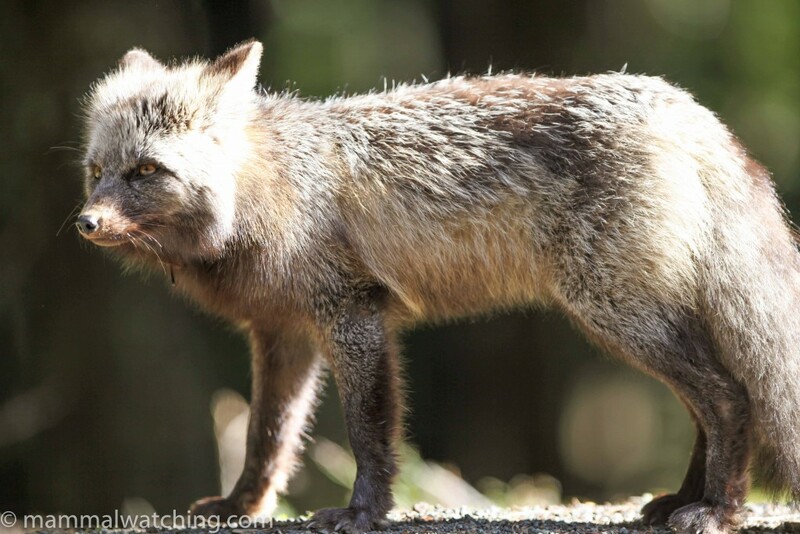 I did however see a couple of the Cascadensis subspecies of Red Fox hanging at the side of the road (which are markedly different to most other Red Foxes I’ve seen) as well as a few Mule Deer. I got back to the airport by 9 p.m. on Sunday – after 1100 miles driving – and took the red eye flight home to Manhattan a couple of hours later. Kudos to Matt for finding a place for Merriam’s. There is no other gen on that squirrel at al, as far as I can tell. Shame about the snow, Jon. I ran into the same thing at both Yosemite and Glacier NP, just had no idea, being an Easterner. The plus side is the high passes often stay open well into November so you can still avoid the summer mobs. FWIW, I found the Cascade Golden-mantled on September 14. I saw numerous Cascade Golden-mantled squirrels at the Paradise visitor center during the 1st week of Sep 97. I too had being looking for them in numerous places that trip.